We WILL see Breaking Dawn's birth scene. 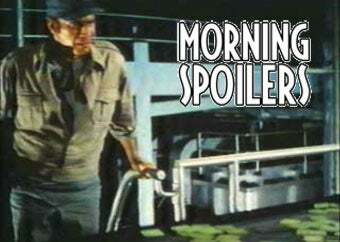 Plus crazy Superman rumors, Green Hornet action and Fringe set pics! Buckle in for spoilers! Find out what we won't see in Breaking Dawn's birth scene. See gorgeous Tron/Red posters. Marvel at crazy Superman rumors. Witness thrilling Fringe/Transformers set pics. Plus Green Hornet, Scott Pilgrim, Mission Impossible, Supernatural, Chuck and Smallville! That was a misquote. The childbirth - all the scenes, I feel - should be on screen. I think perhaps what I was referring to was, would we actually see Edward's teeth through the placenta? I don't think so. I don't think we need to see that, and if someone needs to see that, I think they should take a look at that. [Laughs.] I believe it will be implied, but I don't think we'll see teeth in the placenta. IGN visited the set of this movie, and witnessed the devastation of the Daily Sentinel's offices after a rocket launcher attack by a gang of thugs. The Green Hornet drives his car, the Black Beauty, into the service elevator during the battle with gang lord Chudnofsky — who apparently is a villain going through a mid-life crisis. Also, they witnessed an argument between Britt and Kato at Britt's home. Also, star Seth Rogen says the film is set in the present day, so it'll be "relatable to our experience." Michel Gondry explains how he developed a new way of shooting Kato's action sequences. [I] was trying to find a way to enhance the fight and use a technique that has not been used before. So basically we shoot at a higher rate. We shoot with one camera and then we separate and sometimes one guy is going faster and the other guy's going slower and then the guy who gets slower gets faster and etcetera. It's sort of like you buy a time from the future and then you have to reimburse it. So what it does is it really makes the transfer of energy when somebody hits somebody else so the guy who hits the next guy goes very fast and then the guy when he receives the hit he goes faster. It's like if I hit you - bam! First, you're slow and I'm fast and then when I hit you I become slow and you become fast so I can give you my energy. I can transfer like electricity in some ways. And all that with the camera moving, which makes it quite hard to shoot but it is pretty spectacular. A new featurette gives some more glimpses at the film's action. There's a casting call for the first few episodes of the new season, but nobody's sure if it's real or not. So, you know... grain of salt and all that. [JOEY] Male, suggest 12 to 13 years. Smart, outgoing and brave. Please denote age next to your suggestions... Guest Star recurring role. Some sneak peeks from Friday's new episode and the rest of the season. And here's a clip from Friday's episode, "Butterfly." Additional reporting by Mary Ratliff.